This has to be my favourite way to mess up my kitchen. 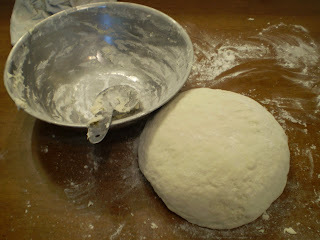 With flour sprinkled from here to there and everywhere, I threw my big ball of dough into a clean bowl and ran off to pick up my son and run some errands. I was the lucky recipient of a Freecycle lead on a restaurant which was giving away all of old their tables and chairs. My husband kindly helped me load four sturdy restaurant chairs into the van and then we picked up ingredients for that night's dinner. When I got home, the ball had taken on a life of its' own. It was gigantic! My new yeast must have been working overtime while I was gone. My son couldn't wait to get his hands into it, so I quickly helped him scrub up and divided that monster into four. We stretched and pulled and pulled and stretched and pounded and sang songs in what we thought was Italian. It probably was not Italian, but we thought it was. We fashioned three pizzas and a loaf. 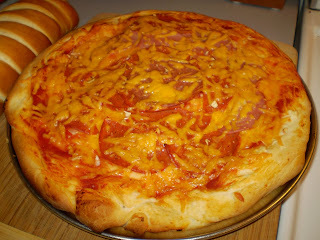 I wasn't sure how my pizza would turn out using this particular recipe, because I have a recipe specifically for pizza dough that I usually use, but I decided to just go for it. The pizza was enormous, more like a deep dish Chicago style. Not that I have ever been to Chicago. The boys liked it, but eating two pieces each was more than enough for us, so I had quite a bit left after dinner. I put a whole pizza in the freezer and we had leftovers for lunch the next day. My loaf turned out amazing as well. See? That there is the beauty shot. I played around a bit with my cuisine settings on my camera to try to convey just how gorgeous my bread is. OK, I am boasting just a smidgen, but it's one of those sense of accomplishment things. 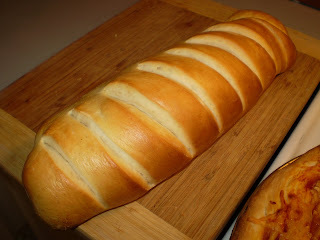 To make bread from a few very simple ingredients and a little patience has to be my most preferred frugal endeavour.